While there are many dual-rear camera phones, and future phones are expected to add even more -- the V40 is a rarity with five. Its rear camera setup includes a standard lens with optical image stabilization, a wide-angle lens and a telephoto lens with 2x zoom that takes dramatic, bokeh-style portraits. Photo quality on the V40 is excellent -- pictures taken in brightly lit settings were sharp and vibrant. LG V40 with its excellent selfie mode and high photo quality can arouse your enthusiasm on photography. But how to backup these awesome photos in time? Syncios gives you two wonderful phone assistant to backup LG V40's photos in convenient way! In the following passages, we will introduce you how Syncios Manager and Syncios Data Transfer work. Syncios Data Transfer is the most convenient form to backup all your photos, whether the pictures you saved or the photos you shot, they can all back up in only one click. 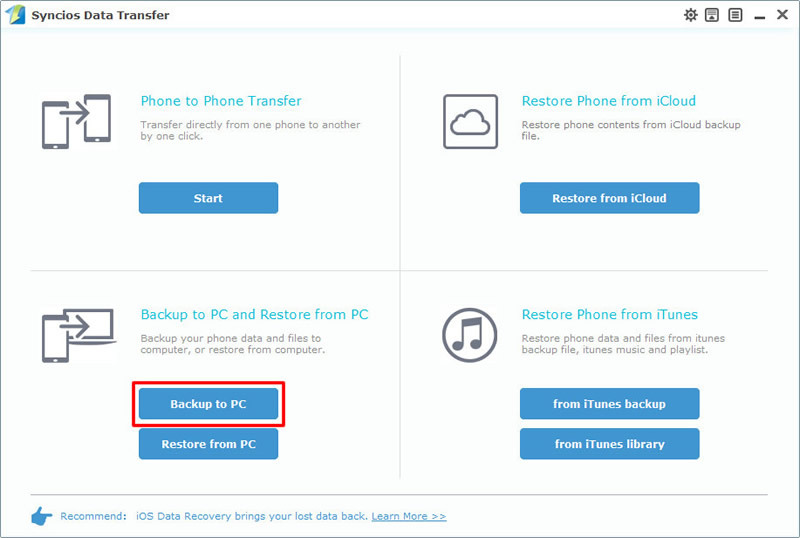 Once you want to restore them back, you can easily find the backup file from Syncios, iTunes and iCloud and restore them in one click operation. 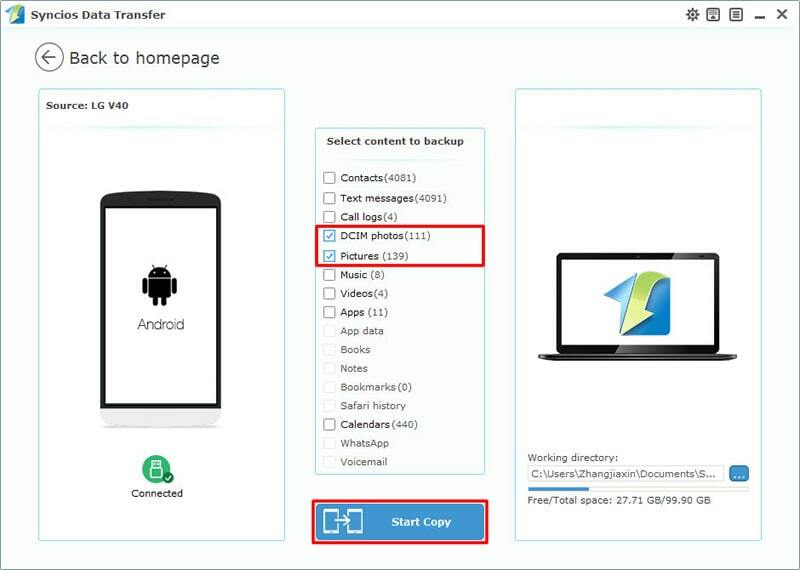 Please install and launch our Syncios Data Transfer first, you can download from homepage or click the download button above directly to download. We have four main categories in Syncios Data Transfer, 'Phone to Phone Transfer', 'Backup and Restore Device', 'Restore from iCloud' and 'Restore from iTunes'. Then launch Syncios and choose 'Backup to PC' function in these four grids. Connect your LG V40 to computer through USB cable or by using Wi-Fi connection. After Syncios finish to sync LG V40, all the contents which can be backup will all show in the interface, grey out options are not support to transfer. 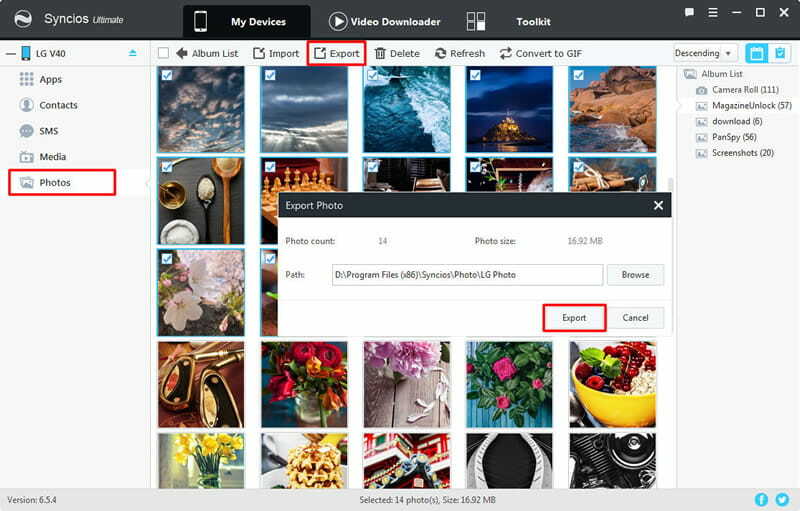 Now select 'DCIM photos' and 'Pictures' options, choose your saving path in advance and click 'Start Copy' to launch the backup process. If you prefer to pick out desired photos than backup all of them you'd better try our Syncios Manager. You can not only backup photos but also can restore them or delete the useless one. You can also make photo GIFs by using Syncios Manager. Now please download and install our Syncios Manager first, you can download from homepage or click the download button above directly to download. Then connect your LG V40 to computer and wait for Syncios to sync. After that, click 'Photos' option on the left side. 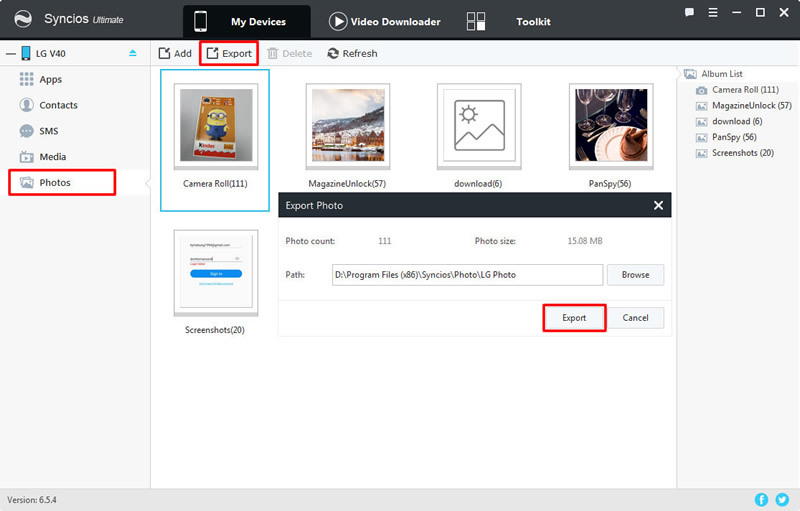 All photo folders include camera roll and other picture folder will all show on the screen. You just need to choose the desired photo folder but only can choose one for a time. Then choose 'Export' button on the menu bar and choose your saving path in pop-up window. Finally click 'Export' to launch the process. To select specific photo, please double click the certain photo folder to enter. And now you can choose multiple desired photo files. Then do the same operations as 'Export Photo Folder' does. Syncios Manager also posses with the '1-Click Backup' function which supports to backup camera roll and other pictures from LG V40 to computer. Other contents like music, videos, apps, contacts, call logs, sms and bookmarks are all support to be backed up as well. NOTICE: Syncios '1-Click Backup' function only open for ultimate user. You can upgrade to ultimate version or know more difference between free version and ultimate version through Syncios' Version Compare. 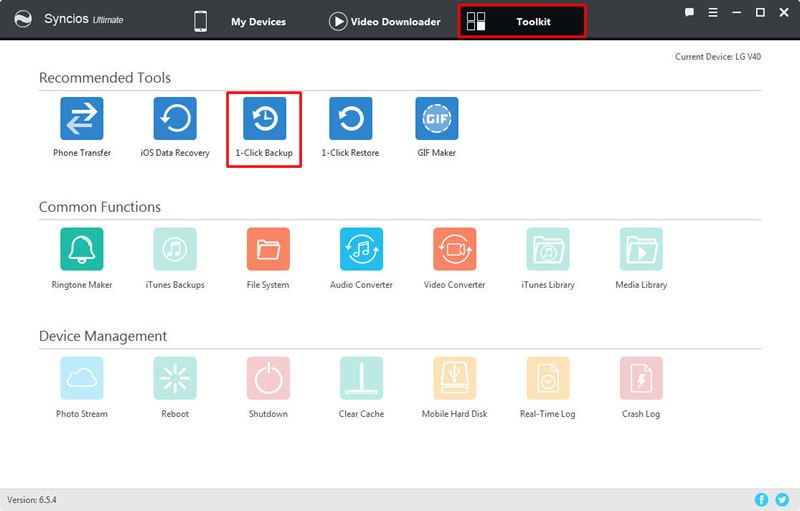 This time go to 'Toolkit' module and choose '1-Click Backup' function. Wait for Syncios to sync LG V40. There will show up a pop-up window, four main contents include Media, Photos, Apps and Information are all list on it. 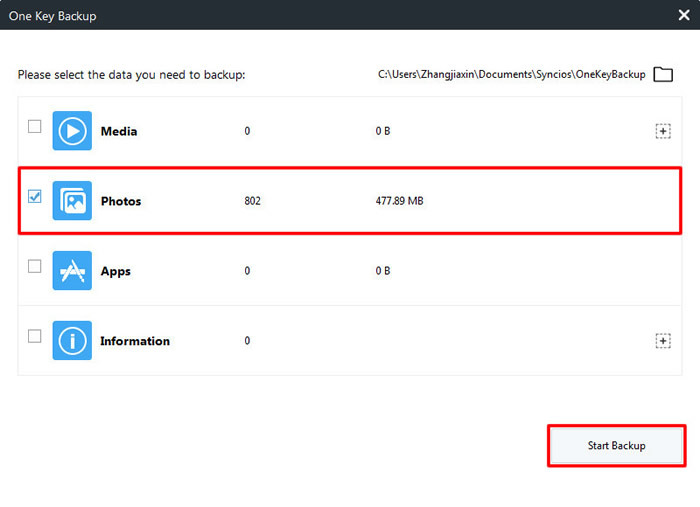 Select 'Photos' option and click 'Start Backup' to backup all camera roll and other pictures from LG V40 to computer. You can use '1-Click Restore' function to recover them back once you need.